Tevis Thompson is a distinguished man. He has reached the rank of "Distinguished Toastmaster." He has spoken at the conference of Toastmasters International. Tevis is a big man with dynamic speaking ability. He is a leader. Most EurAmericans accept Tevis as a fellow EurAmerican, one of those white skinned people, whose ancestors came from Europe. But Tevis' family told him a different story. They told him his ancestors included a relation to Powhatten, who was the Lenape host for the original Jamestown, and a Cherokee women. We now know that if the male DNA chromosome came from Powhatten, then Tevis should have the same Y chromosome. Tevis sent a sample to get an evaluation on his DNA. The DNA analyzers told Tevis that his ancestry was EUROPEAN. But is Tevis' ancestry really European? The Lenape walked away from Greenland in 1350. They migrated for 4,000 miles in 150 years. The migrated through the Dakotas and returned to New Jersey. Then they spread 1,200 miles up and down the Atlantic coast by 1500 hundred. Powhatten spoke Lenape. His original name, his brother's name, Pocahontas' name and the name of the land "TnesAccoma" are all Lenape names. They can be deciphered using Old Norse dictionaries. According to English recorded history, Powhatten sailed into James River from the south before he settled in TnesAccoma. That account would have been consistent with Lenape explorers, who may have traveled further south, encountered the Spanish, and then returned to settle in more secure territory. If Powhatten was descended from men of the original Lenape migration, 150 years earlier, then his male ancestry would be the same as the men of Greenland. What is the DNA of Greenland men? The data from a recent research by Elena Borch, et al, High Level of male-based Scandinavian admixture in Greenlandic Inuit shown by Y-Chromosome anaylsis, 2003, answers the question. 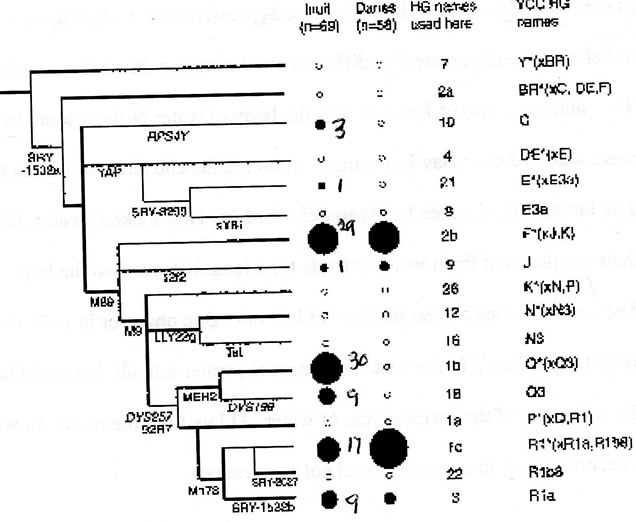 The double dark circles in the upper middle and near the bottom of this chart indicate that Inuit and Danes have the same T-Chromosome DNA markers. The author wrote that the Y chromosome DNA alone could not distinguish between Inuits and 17 Northern European Countries. The Lenape in Roanoke, NC, which is south of Powhatten's home area, taught the Englishman, Thomas Harlot, about the Supreme God, eternal life, the virgin Mary, Lazarus, and Jesus. That knowledge could have come from the Greenland people, who had been Christians for 325 years before the migration. A decade ago, a professor said that "If the DNA researchers find [Northern European] DNA they assume the sample is "contaminated. They throw the sample out." How many American samples of Lenape DNA have been thrown away because their DNA markers showed DNA Y-chromosomes from those 17 northern European nations? The answer to that question is harder to quantify, but the evidence that the pre-selection process occurred is shown by the illustration below. The web site Y Haplo groups in the World male Haplo group DNA data illustrates that the Eurocentric paradigm causes distortion in DNA evidence. Pieces of the illustrations have been clipped and rearranged to show the problem caused by the Eurocentric Paradigm. Part of the paradigm is the belief that no European came to America before 1500 AD. The distortion is shown by the DNA for Greenland and Iceland. Note: That Iceland and Norway appear to have similar Y chromosomes, as expected from history. Before the Little Ice Age Greenland and Iceland had similar DNA because the Greenland culture was similar to Iceland. Evidence from Greenland graves showed that the people in Greenland were buried in clothes only slightly behind the fashions of Norway.But the DNA for Greenland is shown in the Y-Haplo groups of the world as distinctly different than the DNA for Iceland. Over half of the male DNA in Iceland is Haplo groups is R1A & R1B. Greenland still has 58.6% of the males with European DNA, mostly R1A and R1B. The European DNA is not shown on Greenland In the Y-Haplo group presentation. But thousands of Lenape migrated from Greenland to America in 1350. Over half of the men would have had European DNA. That European DNA might be found in over half of all Lenape speaking Americans. Tevis Thompson, a male descendant of Powhatten, has European DNA. So Powhatten had European DNA. The English men of Jamestown were dealing with "cousins." The "cousins" had walked throughout America long before the Englishmen had sailed across the Atlantic. Wallace's newest and most surprising discovery is a set of genetic markers found only in the Objiwa and other tribes living near the Great Lakes; the markers are not found in any other native Americans or in Asia. "We just don't know how it got there," Wallace says, "but it is clearly related to the European population." The simple answer would be the DNA arrived with the European colonists, but the strain is different enough from the existing European lineage that it must have left the Old World long before Columbus. Comment: Wallace measured "... long before Columbus." in milliniums, not cecnturies. The best estimate of the origin of the "genetic markers," to date, is 18,000 years before present. But the European "genetic markers" have not yet been found, for sure, in North America skeletons who died before 700 years ago. Thus, the "genetic markers" may be biological evidence of population(s) that originated in Europe but migrated to America in the last millinium. Comment: The people with haplogoup B genetic markers appear to be from southern Asia who arrived in America by boat. The concetration of people with haplogroup B in the lower-west North American continent overlaps the Zuni culture, which has many similar cultural connections to Asia. A small precentage of these people reached the James Bay and Great Lakes region. Comment: The people of haplogroup D appear to have migrated across the Bering Strait and moved to the west central of Canada and the Northwest corner of the United States. They are not a factor around James Bau and the Great Lakes. Comment: The women with hapolgroup X appear to have entered America via Newfoundland and the Hudson Bay. This migration is consistent with recent (2011) data showing that a significant group of haplogroup X on the east side of the Atlantic occurred in the Orkney Islands north of Scotland. Haplogroup X appears in America, the Orkney Islands and in Palestine. The implications are that the women moved on the sea to or from America and Palestine, but there is not yet enough data to make significant statements. The low percentage of the Haplogroup X indicates that the migration was also an intermixing of peoples and cultures.